To control speed and rotation direction of the DC motor we need some type of the motor driver, one of the most popular schematic is H-Bridge. For the low current and voltages we can use some integral solution like L293D and so on. But if we need more power and reliability we have to build some custom H-bridge using mosfet transistors. This type of the transistors requires careful and proper driving itself. One of the most popular integral solution for driving mosfets is IR2110 from Infineon. In this article we will discuss how to use this IC to build powerful DC motor driver. IR2110 is a high voltage (up to 500V) chip which is suitable to drive various types of the mosfet and IGBT. This device contains both low-side and high-side half-bridge driver. 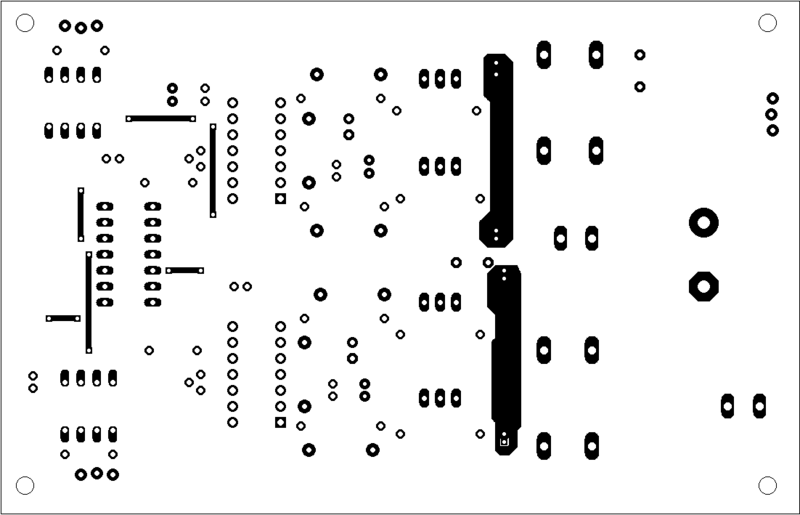 You can find pins description and other parameters in datasheet. This is a half-bridge driver, which means that LOAD pin can be connected to LOAD SUPPLY or to AGND, depending on state of the input pins ENABLE HI and ENABLE LO. This signals can be static voltage of the logic levels (3.3 to 5 volts) or some pulse signals like PWM. 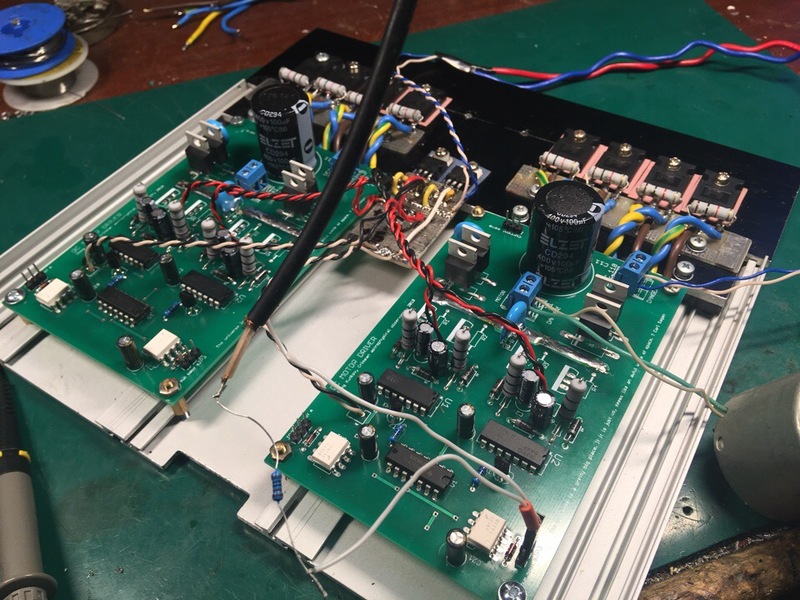 Controlling of the Q2 mosfet is very simple and doesn’t required extra schematics. With Q1 all things is little bit more complicated since SOURCE pin of this transistor is floating without direct connection to the power supply negative line. To be able to enable this transistor we need to create “virtual” zero point and additional power is required. This problem can be solved using bootstrap circuitry. You can see diode D5 and two capacitors C1 and C2. When the low-side is active (Q2 is opened) both capacitors is charging through the diode from the IR2110 power supply (typically 12V). Then when the high-side is became active this capacitors is using to charge Q1 gate and open this transistor. Value of C1 is depends on switching frequency and duty cycle. Typically this value is in range 4.7 – 22 microfarads. Of course there is a formula which can be used to calculate proper value. 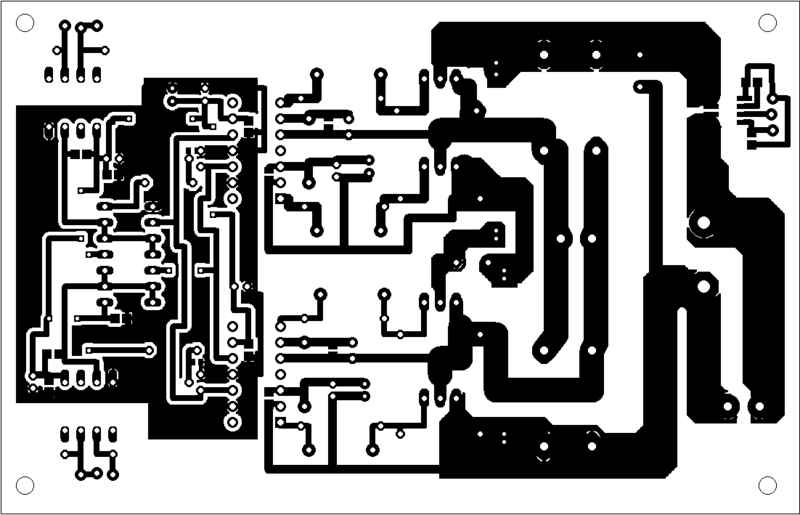 Please read this appnote if you want to know more about floating and bootstraps circuits. But also you can select proper capacitor value experimentally. Proper value is garantie that capacitor can discharge quick enough to close transistor and charge quick enough to reach required voltage value. Better to use tantalum capacitors but electrolyte is also Ok but additional ceramic bypass is required. Diodes D1 and D2 provides quick discharge circuit so both transistor can be closed immediately. Diodes D7 and D9 protects mosfets from the large inductive loads and very necessary when driving motors. Two resistors R5 and R6 is used to limit charging current of the gates to protect transistors. R2 and R1 is an additional protection circuit which prevents floating of the Gate pin and protects transistors from the enabling. When both transistors enabling in the same time is a big problem called shoot through. This is equivalent to short circuit which can destroy both mosfets and ruin your day. 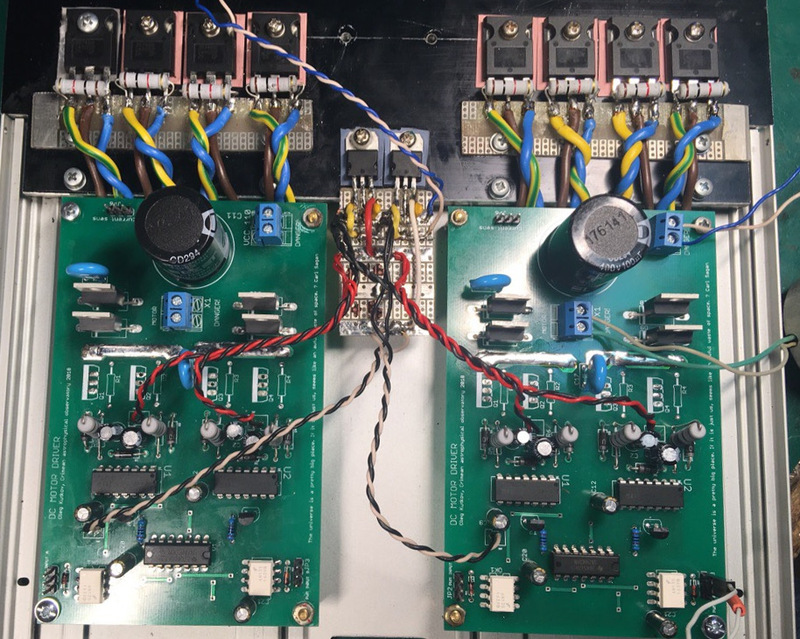 To avoid shoot through of the mosfets we need to ensure that ENABLE HI and ENABLE LO input pins is not activating in the same time. One of the way is to use simple protection circuit which is placed near the IR2110 input pins. 74HC00N is an quad 2-input NAND gate which acts like a cross-locking circuit. 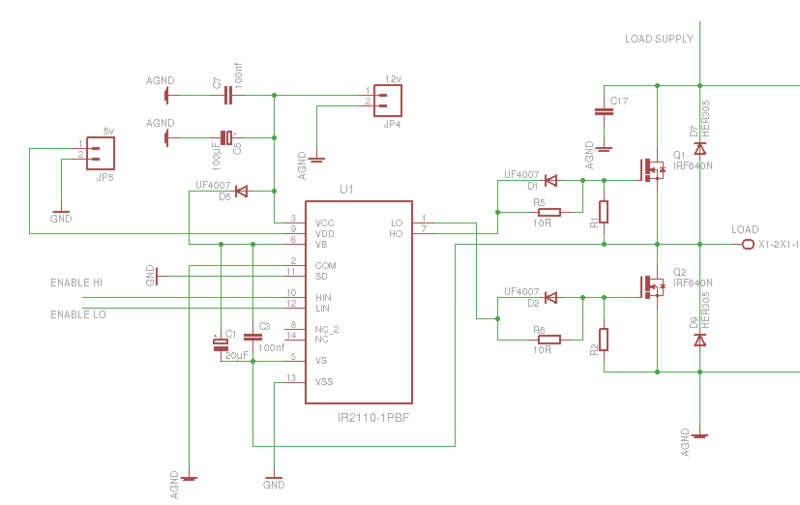 A by-product of this schematic is inverting of the signal so we need to invert actual input signal before. So when IN HI is low (for example) – output pins 6 and 8 is in high state and pin 6 driving actually IR2110 ENABLE HI input. In the same time pin 8 activates T2 transistor which pulls down ENABLE LOW line which is protects this line from the unauthorized activation. Another part of the schematics with T1 works in the same way. To build full H-bridge we need two identical halves of the half-bridge. 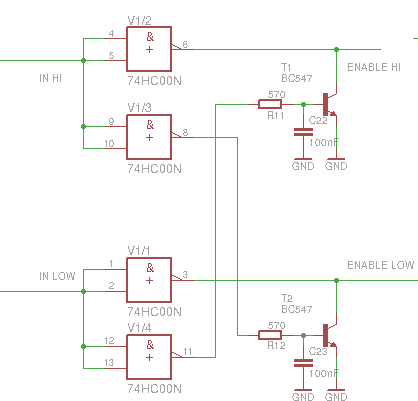 In this case ENABLE HI of the first IR2110 should be connected to the ENABLE LOW of the second IR2110 and vice versa. Load is connecting between LOAD terminals of the both halves. 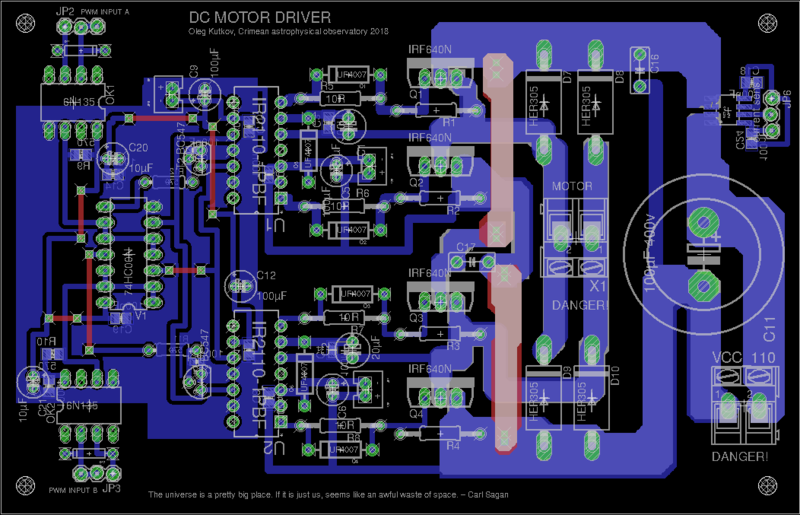 Here is full schematic of the driver which I uses for big 110 volt motors. 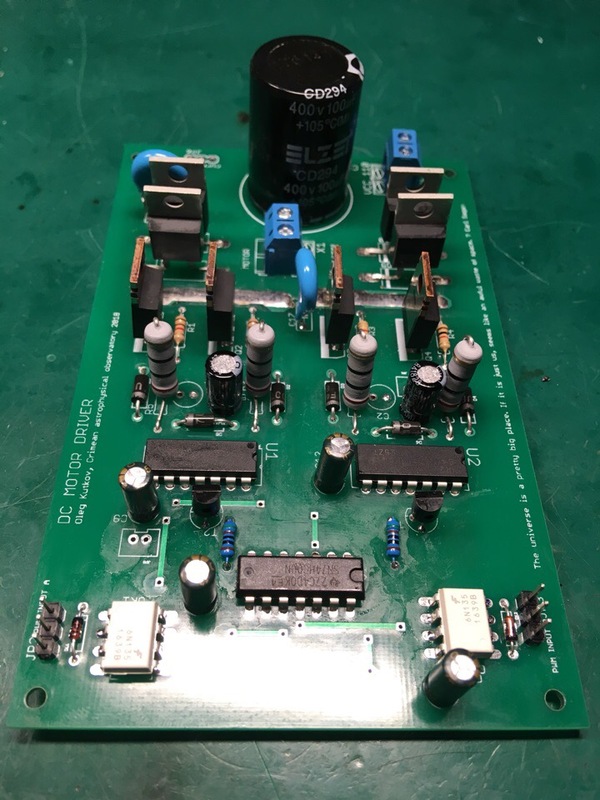 This device contains all protection circuits that described above and also provides galvanic isolation on inputs so we can safely connect microcontroller as PWM signal source. 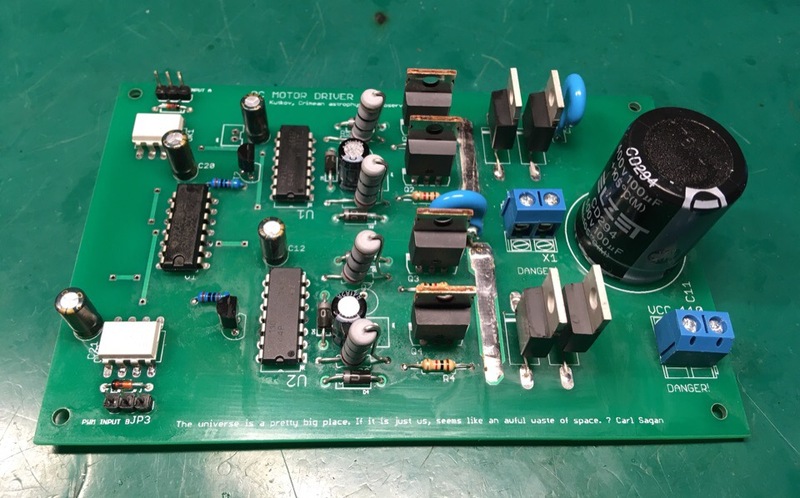 This board requires two stabilized power supplies 5 and 12 volts. Actual bridge is powering from the separate 110 volt source. Also you can find current measurement circuit based on hall-effect sensor ACS712. This part is not mandatory and is simply used in my current project. Diodes D11 and D12 is highly recommended for reliability. This diodes provides path for possible reverse currents (in case of long lines between drivers board and controller) in a bad EMI conditions. Even small reverse current can damage optocouplers led. Values of the R9 and R10 should be selected for your variant of 74HC00. It may be or 570 ohm or 3.8 kiloohm. To debug this part you need a scope, which can helps you to control form of the signal after 74HC00. But if you don’t have one – just replace resistors till schematic became working. Completed boards with medium power transistors. And another variant with big transistors on radiator. This device is able to drive more than 2 kilowatts load. As you can see powerful mosfets is placed on radiators, away from the driver boards. This is permissible, but wire between boards and transistor should be short as possible. Also it’s good idea to twist SOURCE and GATE line as differential pair, this allow to minimize inductance. Protection resistors on this lines should be placed as close as possible to the transistors. You can see everything on the photos above. Laboratory tests of this driver. As PWM signal source I’m using Siglent signal generator in Pulse mode. Frequency is 15 kHz, duty cycle is changing which is cause changing in motor rotation speed. Hope this material will be helpful. Next Next post: Low noise and low cost amplifier for radio astronomy, 21 cm band.